My take on this weeks Artorder challenge. I imagine the Bromide race as humanoid tribes that use Plants and fungus as a primary material. As they began to expand the use of the plants, a symbiotic relationship began to evolve. 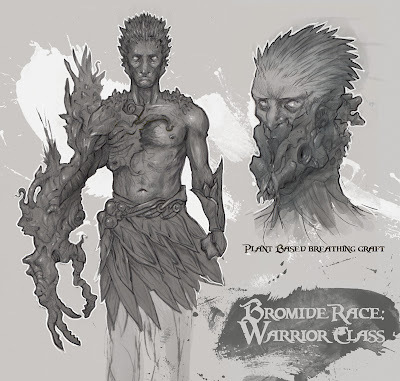 Now the Bromides ritualistically remove a limb as sacrifice and symbol and regrow a symbiotic replacement. The breathing "graft" is also Symbiotic as the Bromide exhales the plant instantly converts the Co2 into oxygen, giving the wearer the ability to enter low Oxygen environments. mann you sure have some kickass work! This reminds me of Tree Man from the highly-acclaimed TLC special.